President Obama will pardon a turkey once again Wednesday at 1 p.m. in a ceremony that has become an annual presidential tradition. But the history of that tradition is actually not as long as one might think. Nov. 25: Joined by daughters Sasha and Malia, President Barack Obama granted an official pardon to the White House turkey Wednesday. NBC's Brian Williams reports. Adding to the confusion, President Bill Clinton claimed on Nov. 26, 1997 at his pardoning ceremony: "President Truman was the first president to pardon a turkey." But the Truman Library wrote in 2003: "The Library's staff has found no documents, speeches, newspaper clippings, photographs, or other contemporary records in our holdings which refer to Truman pardoning a turkey that he received as a gift in 1947, or at any other time during his Presidency." In fact, "Truman sometimes indicated to reporters that the turkeys he received were destined for the family dinner table," the library wrote. It appears that Abraham Lincoln, in a way, was the first to spare a turkey. But it wasn't a Thanksgiving turkey. It was a Christmas turkey his son had taken for a pet. Clinton in that same 1997 speech: "[T]he tradition actually began 83 years earlier when President Lincoln received a turkey for Christmas holiday. His son, Tad, grew so attached to the turkey that he named him 'Jack,' and President Lincoln had no choice but to give Jack the full run of the White House." President George W. Bush made reference to the same story in his “pardoning” ceremony in 2001. 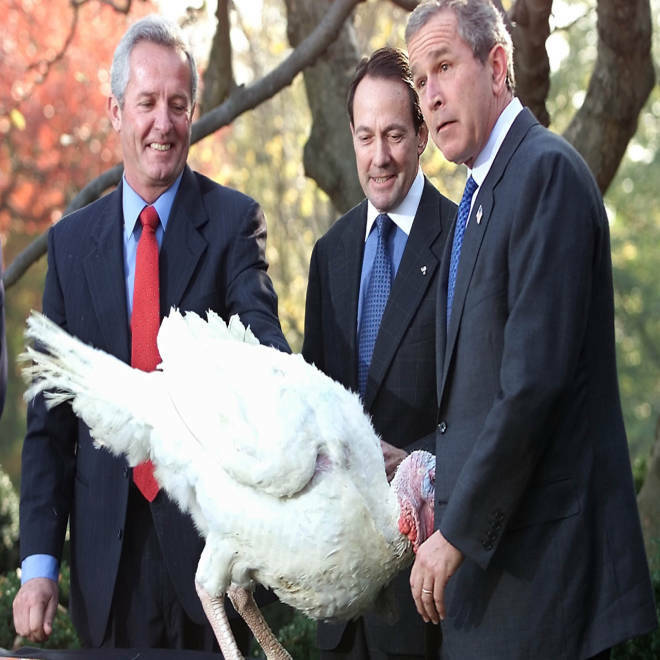 President George W. Bush meets Liberty, the turkey to receive the annual Thanksgiving Presidential Pardon in the Rose Garden of the White House 19 Nov. 2001. It appears it was John F. Kennedy in 1963. An NBC News archive search found a Los Angeles Times article dated Nov. 20, 1963 with the headline, "Turkey gets presidential pardon." And that turkey was a monster. The paper described it as a "55-pound broad white tom." Despite a sign hanging around the bird's neck that read, "Good eating, Mr. President," Kennedy took a look down at the "frightened, panting bird" and said, "We'll just let this one grow." A version of this history of turkey pardons – “Beg your (Turkey) pardon” -- was first published on First Read Nov. 25, 2009. NBC's Donna Mendell contributed to this report.